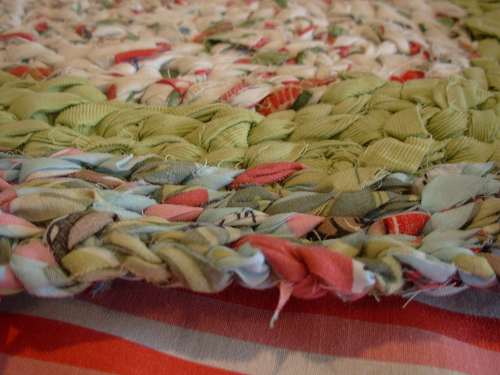 I love the idea of this rag rug. Has anybody ever made something like this? It seems quite quick to work up and working with strips of fabric is new to me too. 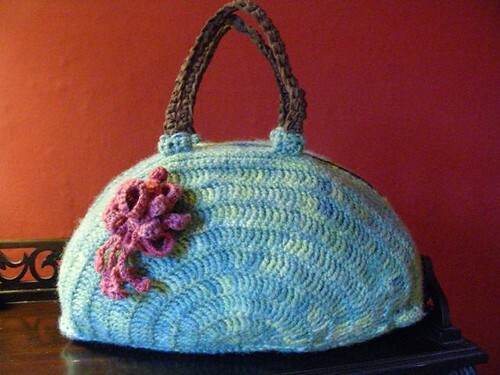 This comfort pack was found on Crochet Me here looks like I am going to make a few of these. 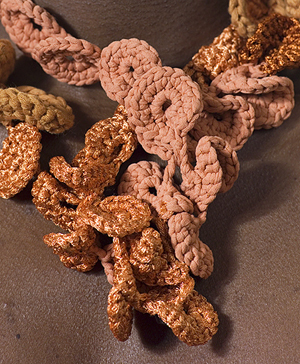 Go and have a look at the *re-newed* Crochet Me anyway. They have changed the look of the site. 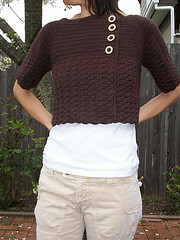 And I have not mentioned any of the crocheted and felted patterns you can find on the net. Heaps of inspiration also on Whip-Up Craftzine (thanks for the link Jaime) and Craftster. Good luck everybody with the new theme I am really curious what you are making, hopefully we get to see an enormous variety of projects over the next 8 weeks. I love the necklace!!! – I am available if anyone needs help on the bag. Its very easy I promise. Thanks Vicki, I really want to have a go at this.